The the fastest way to a healthy mind is a healthy body, and all of us could probably do a bit more when it comes to exercise. Due to the mobility of smartphones, they are easy to fit into a workout routine, and wherever your device goes, applications are sure to follow. For sports such as jogging and cycling, fitness apps are usually about providing data tracking. Mostly this consists of apps like Runkeeper and Endomondo that use GPS to track your route, work out the distance you have travelled, and quantify how many calories you burned off doing it. With the use of third-party accessories, these maps can also measure your heart rate as you run. Other fitness apps, ideally suited to beginners, can make use of your media player to offer instructions, incentives, and encouragement. Apps such as Pocket Yoga and All-In Fitness contain detailed databases of how to correctly stretch and lift weights, both for your own health and safety. and to maximize your workout. This tracking app allows you to monitor your duration, distance, speed and calories in an endurance sport such as running, cycling or walking, using GPS. 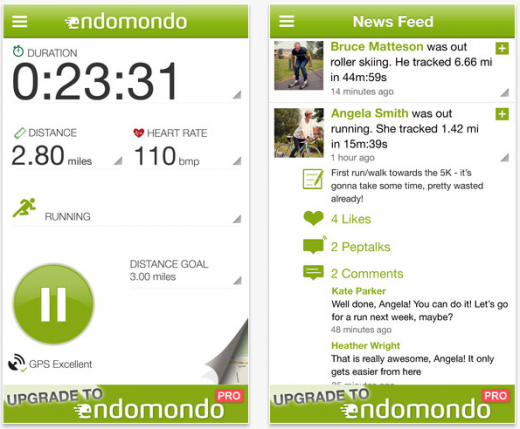 Once you complete your workout, Endomondo gives you all the facts to analyse your stats. 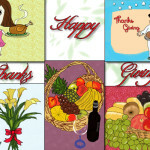 However, the feature that sets this app apart is its massive social network. 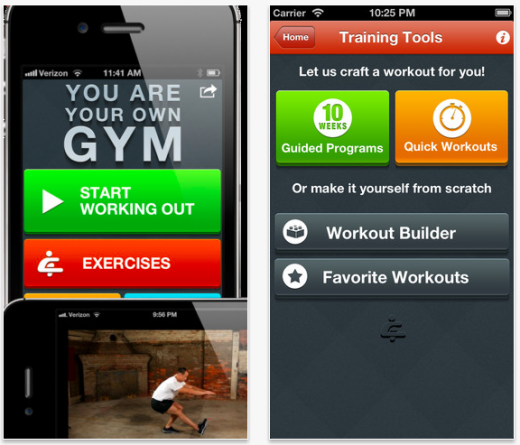 Interact with other users, compete against their times, share routes and workout routines, and send friends pep talks. Monitor your position on a live route map and track your stats. 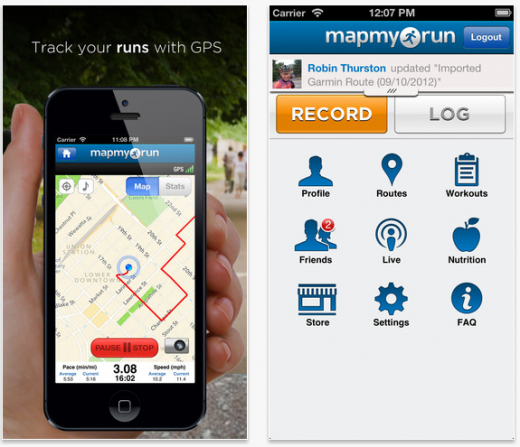 MapMyRun Logs your pace, distance, calories and nutrition, and will give you audio updates on your progress. To encourage you to meet your goals, MapMyRun offers sponsored challenges with big prizes for the winners, including running shoes and holidays. Brag about your best lap time with in-app Facebook and Twitter compatibility, and capture your training moments with photo geotagging. Have fun while getting fit with this running game. The premise of the app is that while you are out jogging, you hear the guttural groans of the undead through your headphones and you must outrun them to escape. 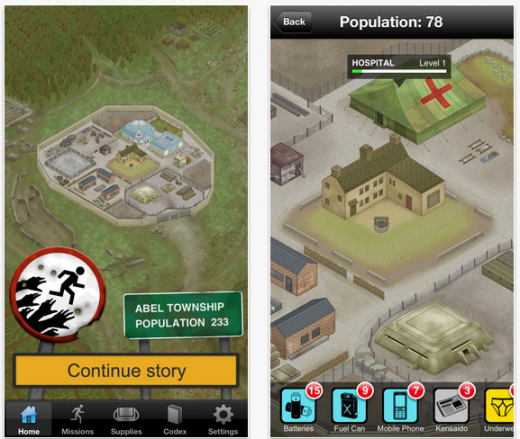 With over 40 runs-worth of content, a detailed Story, and the option to mix the action with your music library, Zombies, Run! is an immersive experience. If you don’t find stats and graphs motivational, this might be just what you need. Practise yoga at your own pace and on your own schedule with Pocket Yoga. Simply set your device in front of your mat, choose a position, and this app will guide you though an entire session. Featuring detailed voice instructions, you need never look up from your Downward-Facing Dog. If you’re uncertain about any of the app’s 145 poses, there are detailed entries for each one, including illustrations of the correct positioning and a list of health benefits. 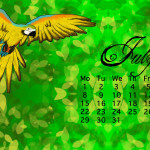 View videos from dailyyoga.com. 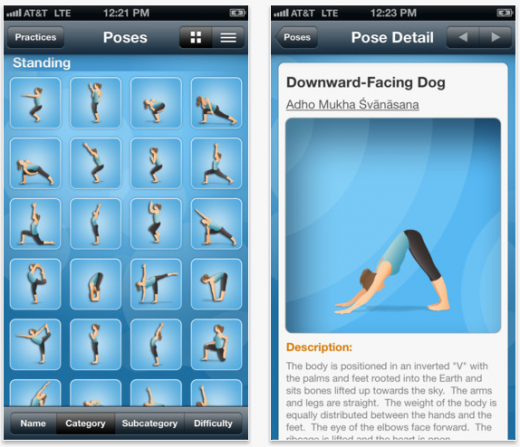 The app is packed with HD videos poses and prolonged yoga sessions. All the beginner videosare free, but pro classes require a monthly subscribtion. Sessions are easy to jump right into, sorted by the area it is good for, such as Daily Yoga for Back or Daily Yoga for Abs, rather than by technical terms. To add to the sensation you are in a real yoga class there is optional background music and a social community that you can access through Facebook. MyPilatesGuru is a companion to the book of the same name. Beginners who don’t also have the book may struggle with the lack of info available in sessions, though there are tips indicated in speech-bubble icons to guide you through. The Common Mistakes tab also offers advice. Better suited for more experienced users who are looking for a more hands-off app, this doesn‘t just allow you to select the level of difficulty for your sessions – you can also adapt preset sessions or create your own from scratch. This app claims there is no need to sign up with a gym to get fit, you’ve got everything you need at home. Body Weight Training: You Are Your Own Gym is presented by Mark Lauren, a former fitness instructor to US Special Ops, so he knows what he’s talking about. Don’t be put off by the drill sergeant stereotype; Body Weight Training is quick, easy and suited to all fitness levels. While it is designed as a ten-week course, the app features 200 videos, so this should be enough to warrant repeat viewing. As well as the guide course, there are quick workouts to dip in and out of. Abs Workout offers a range of videos to help you master stomach crunches. Don’t be put off by the name, this app works more than your abs – crunches will also tighten your buttocks and sculpt your pecs. Instructional videos can be downloaded, so you can workout when you don’t have internet access. Abs Workout is a fairly one-way process, counting your reps and sending reminders, but you can move from one exercise to another with a tap of the screen. 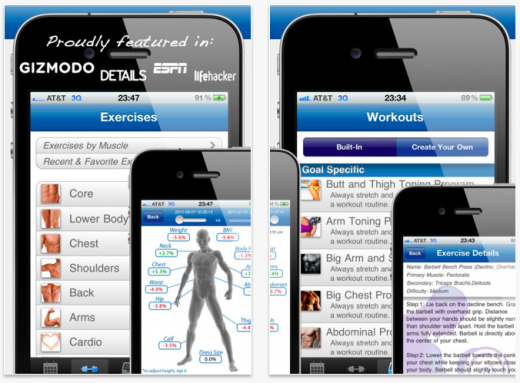 This app includes a comprehensive guide to gym workouts. One major advantage is that it does not include its memory-munching wealth of over 700 HD images, only downloading them when you select an exercise. Filter by exercise or the muscle group you want to improve. Each entry comes with step-by-step photos and detailed descriptions. Plan your regime using the calendar on the opening screen.